If one thing’s for sure, it’s that flowers make people feel special. In fact, 86% people confirm it. Not only is getting blooms a special occasion, but it is perceived by 99% of people that the giver is very thoughtful. One of the most special flower arrangements a girl can receive is her wedding bouquet. Even though it may not be explicitly from her finance, it symbolizes their love and the joining of their roots, as well as serves to beautify the whole already beautiful process. But flowers aren’t only for bouquets and centerpieces. Consider these creative ways to incorporate nature’s amazing decor into your wedding. If you are having a romantic outdoor wedding, you might feel like the ambiance is somewhat ruined by the ugly tent support beams. Never fear! Simply cover them up with full lush garlands, and your guests will feel like they are eating in a tropical paradise. For a woodsy vibe, go for pine or eucalyptus branches, whereas for a more delicate vibe you may want to have woven daisy chains climbing up the walls. Co-opt the use of a fountain and layer boughs and cascading blossoms to create a vision of cake-like decadence. Take it a step further even and place floating lily pads and candles into the pool itself. Not only will this unique take on decoration make your wedding stand out, it will also perfume the air every time the breeze blows. 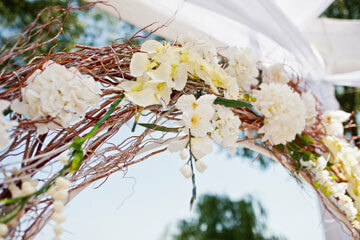 Opt for an elegantly simple display by hanging flowers upside down with white ribbons for a striking effect. Don’t forget the power of symbolism, either. In Russia, red tulips are said to symbolize deep love — ask if they have tulips for your chandelier at your local florist shop. Instead of a crystal candy dish, consider giving the gift of life to your guests by sending them home with a small potted plant. They’ll serve as decoration during the reception, and when your guests take them home, they will have a keepsake from your wedding to remind them of the magical night. Whether you’re looking at spring bouquets or wedding flowers on a budget, adorning your wedding venue with bright blossoms is a no brainer. Check out an online florist or a florist shop to get a feel for what you want!